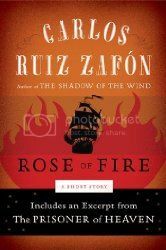 Rose of Fire is a free ebook prequel to the Carlos Ruiz Zafón's The Cemetery of Forgotten Books series. The story is described as telling the history of the Cemetery of Forgotten Books, which intrigued me as this remains on of the main mysteries for me in the first two books of the series, The Shadow of the Wind and The Angel's Game. However, while the story does tell the origins, it doesn't tell the complete history of the Cemetery, so while it answers some questions, it really just leaves as many questions. Part of me would like a more complete history of the Cemetery, but there's still a part of me that doesn't want it explained, that feels that the origins of the Cemetery should remain shrouded in mystery. The ebook also includes the first four chapters of the final book, The Prisoner of Heaven, so if you are a fan of Zafón and the Cemetery of Forgotten Books series, this would be an excellent read. Of course, the ebook is free, so really, how can you go wrong?